How to Make the Dough. In the center of a large cutting board or pasta board, place the flour in a mound. Use a bench scraper in hand, set aside about 1/6 of the flour.... A dough cutter is used to cut dough, when making bread or pizza. A dough cutter makes it easier to get an accurate cut of dough. If your knife is dull or is caked with dough, it will pull at the dough instead of cutting through it. I If you cut through the dough too slowly the knife will pull at the dough and not cut through. Use a swift, firm motion to cut the 1/2-inch slash in the dough. (However, if your recipe calls for water or egg wash on the dough, you’ll want to use shallow, but swift knife strokes and... Firm dough will be suitable for rolling out and cutting shapes. Flavourings for soft dough - mix in some hundreds and thousands or choc chips and roll into bal00ls. Place on trays and flatten. 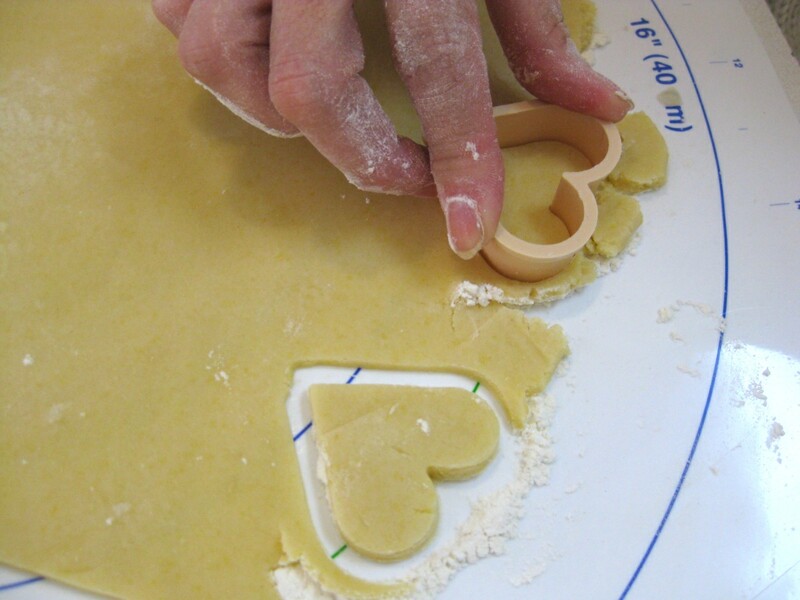 Use a knife or cookie cutters to cut the dough into desired shapes. With a thin metal spatula, transfer the shapes to a baking sheet. With a thin metal spatula, transfer the shapes to a baking sheet. how to cut glazed porcelain tile Cut the rest of the cookies, efficiently positioning the cutter each time to cut as many cookies as possible from your rolled-out dough. Take the inevitable scraps, squash them together, and refrigerate for 10 minutes, if you have time; this’ll make them easier to roll. Repeat the process above until you’ve used all the dough. When I began my cookie adventure, I only used cookie cutters to get my shapes. I didn’t know much about how to hand cut cookie dough or using different cookie cutters to obtain the shapes I wanted. Dip your cookie cutter in a bit of flour to ensure the dough doesn’t stick to it. This will also cause your shapes to come out with crisp edges. If your cookies are stuck after you cut them out, use a bench scraper or spatula to gently pry them off the counter and transfer them to a baking sheet. To cut, lay a cookie cutter on the dough, firmly press straight down and lift straight back up without twisting or sliding the cutter. When lifting the cutter, use your finger or a chopstick to gently press on smaller or more detailed areas to help release the dough. If the cutter is sticking, dip the edges in confectioners' sugar before cutting.